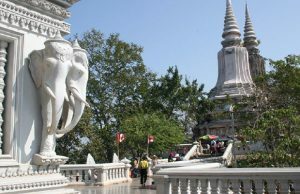 Silver Pagoda is located in the southern portion of the Royal Palace complex. Silver Pagoda was formerly known as Wat Uborsoth Rotannaram because it is where the King worshiped, prayed and practiced every Buddhist Silas Day. In the additional, the royal family and officials also held Buddhist ceremonies there. Silver Pagoda has no monks. But this Majestic King Norodom Sihanouk lived there for one year when he entered the monkhood on July 31, 1947. Because the pagoda has no monks, tourists often refer to it as Preah Vihear Preah Keo Morakot. When the King celebrates Buddhist ceremonies, monks from other pagoda such as Wat Unaloam and Wat Botumvattey are invited to attend the ceremonies. Preah Vihear Preah Keo Morakot was built between 1892 and 1902, during the region of King Norodom, but at that time it was constructed of wood and brick. Its design is base on Cambodian architectural style. Then Banhchos Khan Seima ceremony was held on Feb 5, 1903. Silver Pagoda was later damaged, and Queen Kosamak Neary Rath asked that it be repaired. 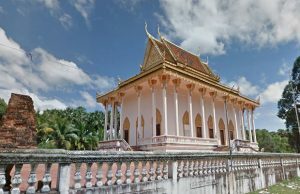 Under the direction of her son Samdach Preah Norodom Sihanouk, who at that time was the head of state, the old temple was dismantled and reconstructed in 1962 on the same site with reinforced concrete. The floor was laid with silver tiles, and the columns were covered with glass stone imported from Italy. The architecture, however, remained the same. This temple is called Pheah Vihear Preah Keo Morakot because the main Buddha statue is made of priceless emerald, which Cambodians call Keo Morakot. Westerners, however, prefer to call the temple the Silver Pagoda because of the 5.329 genuine silver tiles that cover the floor. There are 1.650 art objects housed in this temple. Most of them are Buddha figures. They are made of gold, silver, bronze and other valuable materials. Some are decorated with diamonds. They are gifts from the King, the royal family, dignitaries and other people who worship at Preah Vihear Preah Keo Morakot, where they pray for peace and prosperity, for happiness and for the preservation of Cambodian cultural heritage for the next generation. In front of the throne, site a Buddha statue made of gold, weighing 90 kilograms and decorated with 2.086 diamonds. The biggest diamond is on the crown. It is 25 millimeters. This statue was commissioned in 1904 by King Sisowath, following the suggestion of King Norodom. King Norodom said, after his body was cremated the gold casket should be melted to make Buddha statue representing Preah Srei Araymetrey. This Buddha statue is named Preah Chin Raingsei Rachik Norodom. 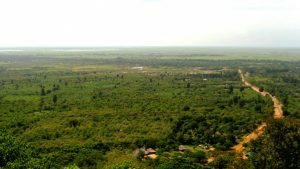 Objects of particular interest in the Preah Vihear Keo Morakot include: The Preah Keo Morakot, the Emerald Buddha, which sits atop throne in the center of the temple. There is a small glass cabinet that contains what Buddhists believe are ashes of the Buddha. The ashes were brought from Sri Lanka in 1956 by Samdech Head Monk Lvea Em, who stayed in Wat Langka in Phnom Penh. In a nearby cabinet sits a gold Buddha figure offered by Queen Kosamak Nearyrath, mother of King Norodom Shihanouk, in 1969. This Buddha figure is protected by naga. It represents when Buddha stayed at the Muchalonti Pond. Objects in other cabinets are the keepsakes and decorated objects for royal and Buddhist ceremonies. The temple is surrounded by lofty gallery. On the wall of the gallery, there are traditional paintings of the entire Ream Ke epic. These paintings were done by 40 Cambodian artists between 1903 and 104 under the direction of Oknha Tep Nimit. The Ream Ke painting is 642 meters long and 3meters high. It starts from the south of the eastern gallery and winds its way around the gallery. This means that visitors must walk in a circle to see the entire story. The ancient epic Ream Ke along the gallery shows a unique scene not copied completely from Indian Ramayana. Because some plots of Cambodian Ream Ke are so mysterious, visitors mush look at the painting carefully. 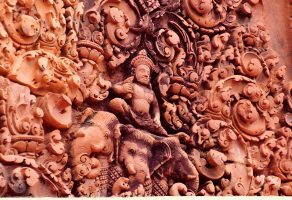 Visitors who are familiar with Indian Ramayana will understand the Cambodian Reap Ke easily, even thought the two versions are different. Some themes are also depicted by La Khon Khaol or depicted in Sbek Thom and other sculpted figures. Astrologers also use the story to tell fortunes. Weather, structural damage and destruction by visitors over the years have caused the paintings to deteriorate. In 1985, the Cambodian government was cooperating with the government of Poland to restore, protect and maintain the paintings. The venture lasted only five years, however, because the budget was terminated. Today the Cambodian government is looking for way to conserve, restore and maintain this cultural heritage. Monks from Phnom Penh and other provinces once studied the Pali language in classes that were held along the gallery before the Pali School was opened in Phnom Penh on Dec 16, 1930. In front of Preah Vihear Preah Keo Morakot, are two stupas and a statue under the roof. The south stupas hold the cremains of King Ang Doung, the great-great grandfather of King Sihanouk. The north stupas hold cremains of King Norodom, the great grandfather of King Shihanouk. Both stupas were dedicated on March 13, 1980. The statue of King Norodom riding a horse was erected in 1875. It was the keepsake of the French King Napoleon III. It was kept in front of Preah Vihear Preah Keo Morakot in 1892, but at that time there was no roof. During King Sihanouk?s crusade to win independence fron France, he prayed in front of the statue. After Cambodia won its dependence on Nov 11, 1953, King Sihanouk had the roof built in honor of King Norodom. South of Preah Vihear Preah Keo Morakot beside Thamma Hall, a place for praying, and the stupa of King Sihanouk?s father, King Norodom Soramrith, which was built in 1960, visitor find: Keung Prah BatKeung Preah Bat houses the footprints of the four Buddhas who have already reached enlightenment. Those Buddhas are Kok Santhor, Neak Komonor, Kasabor and Damonakodom. In additional to the four Buddha, Preah Srei Araynetrey, whom Buddhist believe has not yet been born. They believe that he will come 5,000 years after the fourth Buddha reaches Nirvana. Buddhists believe that Preah Srei Araymetrey will come and help the people. Phnom Khan Malineati Borapat Kailasha Phnom Khan Malineati Borapat Kailasha or Phnom Mondul is the manmade hill that represents Phnom Kailasha, where the Buddha left his footprints on the stone. On the Phnom Mondul, there is a statue of the Buddha and 108 blessings of life before the Buddha reaches enlightenment. Kunthabopha Stupa was built in 1960 as the resting place for the ashes of Princess Norodom Kunthaboph, the daughter of King Norodom Sihanouk. She was 4years old when she died of dengue fever. The stupa’s design is base on the ancient Banteay Srei temple in Siem Reap. West of Preah Vihear Preah Keo Morakot is a bell hall. The bell is used in the various ceremonies and to mark the opening and closing of the Silver Pagoda. In the past, the bell was also used to call the monks who studied Pali in the palace. To the north, is a building that houses. Tipitaka, the fundamental scriptural canon of Buddhism. They include: Sutta Pitaka The Sutta Pitaka, a collection of discourses, is primarily composed of dialogues between the Buddha and other people. It consists of five groups of texts: Digha Nikaya(Collection of long discourses), Mijjhima Nikaya (collection of medium discourses), Samyutta Nikaya (collection of grouped discourses), Anguttara Nikaya (collection of discourses on numbered topics), and Khuddaka Nikaya(collection of miscellaneous texts). In the fifth group, the Jatakas, comprising stories of former lives of the Buddha, and the Dhammapada (religious sentences), a summary of the Buddha’s teachings on mental discipline and morality, are especially popular. The Vinaya Pitaka, the code of monastic discipline, consists of more than 225 rules governing the conducts of Buddhist monks and nuns. Each is accompanied by a story explaining the original reason for the rule. The rule are arranged according to the seriousness of the offense resulting from their violation. The Abhidharma Patika contains philosophical, psychological, and doctrinal discussions and classifications. It consists of seven separate works. They include detailed classifications of psychological phenomena, metaphysical analysis, and a thesaurus of technical vocabulary. The Building also houses a Shiva?s mount Nandi. This figure was found buried in Koh Thom district in Kandal province in 1983. It is estimated to be 80percent silver and 20percent bronze, copper, lead, Iron and zinc.